In the following I have worked my way around some examples of glasses of today. The fishing industry generates several circumstances where many tons of fish scales are leftover. 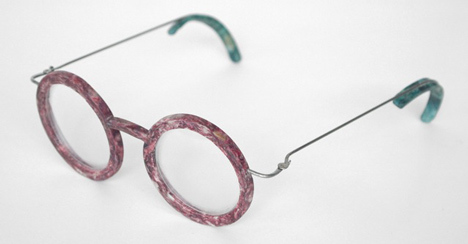 Using this waste as resources for the production of his fish-scale-plastic, Royal College of Art graduate Erik De Laurens has made swimming goggles and spectacles simply out of fish scales. The scales get cleaned, dried and died and after this, processed – this step requires heat and pressure. During that process the fish scales release their own binding agent which when dried makes the material very hard. The fish scale glasses ‘the fish feast’ are on display at the Hello Materials exhibition at the Danish Design Centre. There is not much material innovation in these following glasses – it is more or less ‘just’ going back to one of the basic materials on this earth – WOOD. Nevertheless, wearing these pleases our wants and says a lot about who we are. Save the world and look good doing it ! 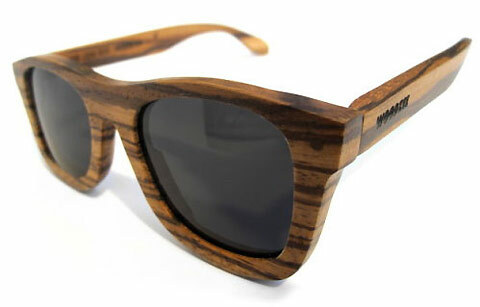 Based in Northern California Woodzee makes handmade sunglasses and adds that personal touch that just can’t be found in your typical factory made sunglasses. As a bonus they plant a tree for every pair of glasses sold. 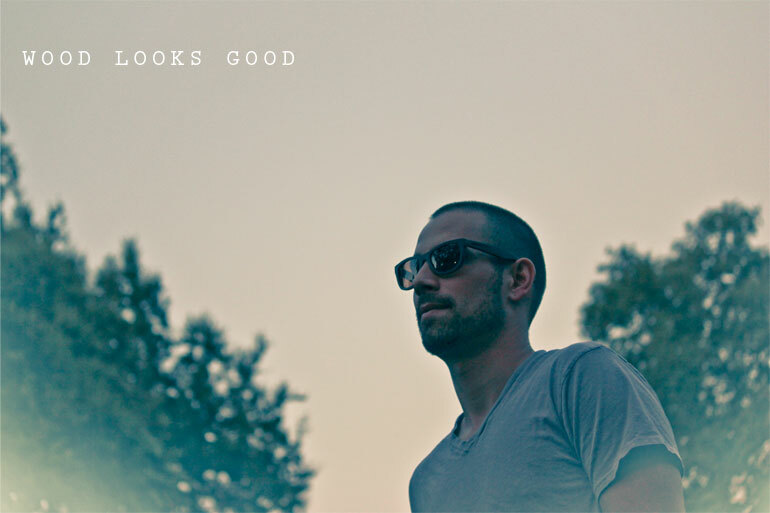 Tucked away in Georgetown, Washington, PANDA produces a line of luxury eco-friendly sunglasses handcrafted from sustainable bamboo and recycled polycarbonates. For every pair purchased PANDA will provide an eye or medical exam to a person in need and will also donate a pair of prescription glasses. A study showed that the percentage of children currently in need of glasses can be as high as 50% in some states in Mexico, and about 11% are not learning at all, simply because they cannot see. “See Better to Learn Better” is a program working on providing free eyeware for students in the age of 6-18. 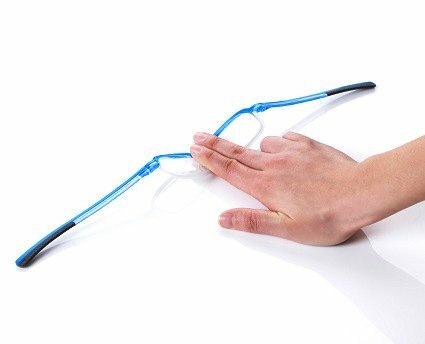 Sponsored by the Mexican Government and Verbien/Augen Optics and designed by Yves Béhar/fuseproject the glasses come in seven different colors, five shapes and three sizes. The glasses are made out of advanced Gilamid plastic, with its hyper-flexible property, making them practically indestructible – thus they wont easily break into two on the soccer field. In 2011 the “See Better to Learn Better” program won the INDEX: Award in the BODY Category. There is a clear tendency in the want of having one-off objects that makes us unique. More and more the individual wishes to be different and what we wear, buy or surround us with is an easy way to make a statement about who we actually are. 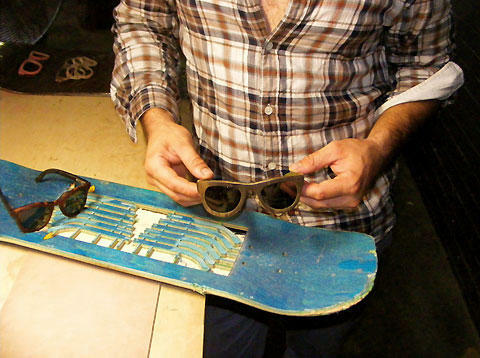 Taking old skateboards and handcrafting them into unique sunglasses with even artwork remnants from the board, Brisbane’s Holloway Eyewear‘s charter is to create while reducing. 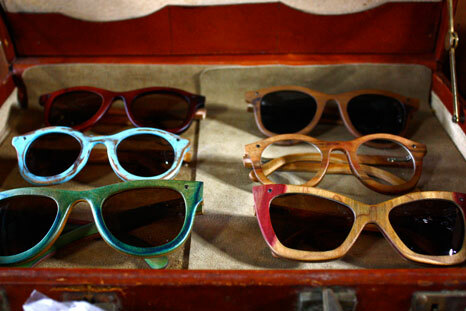 By doing so they create one-of-a-kind frames with a distinct antique finish. Imagine all the places your shades might have been before they got to your face. Cool. For more pictures on Holloways Skateboard Glasses, don’t miss this beautiful photo series. 5. The future is already here – almost! Technology has gotten to a point where it gives us a possibility to really turn our perception of glasses upside-down – furthermore it turns upside-down on how we see and interact with the world we live in. Here a bonus movie on how regular contact lenses are made. A Day Made of Glass, showed Corning‘s expanded vision for the future of glass technologies. 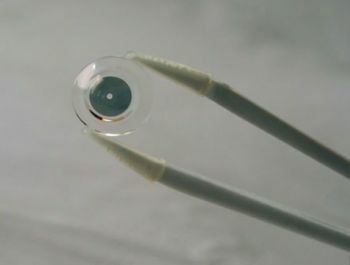 And referring to the DARPA AR contact lenses where when wearing them it will be possible to read a heads-up displays projected directly on the glass, now Google just unveiled their vision for their “Project Glass” – augmented reality eyewear. One day, when Technology has taken another big step towards a true cyborg world and we’re all using retinal implants with built-in augmented reality tech, Google’s Project Glass will seem odd. But today, it’s the future. Sort of. Every now and then we will post a ‘HIGH FIVE on materials’. If you got something to share with us – a theme or perhaps some interesting material case storey for another ‘HIGH FIVE’ post – then please do share it.